Australia has sent athletes to almost all editions of the modern Olympic Games. Australia has competed in every Summer Olympic Games, as well as every Winter Olympics except 1924–32 and 1948. In 1908 and 1912 Australia competed with New Zealand under the name Australasia. 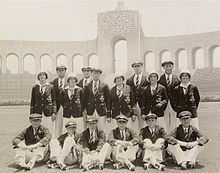 Australian Olympic athletes in 1932 wearing the traditional uniform of a dark green blazer trimmed with yellow, still in use at the London 2012 opening ceremony. The Australian Olympic Committee was founded and recognised in 1895. Edwin Flack was the first athlete to represent Australia at the Olympics. He won gold in both the 800 metres and the 1500 metres, competed in the marathon and won a bronze medal in tennis doubles at the 1896 Summer Olympics in Athens, Greece. Australia's kit is green and gold. Australia has hosted the Summer Olympic games twice: in 1956 in Melbourne and in 2000 in Sydney. Australia finished 3rd and 4th in the respective medal counts. In the Summer Olympics since 2000, Australia has placed 4th, 4th, 6th, 8th* and 10th respectively. (*Australia initially finished in 10th position in 2012, but 8th position after the redistributed gold medal to Jared Tallent). Given Australia has a population of only around 23 million people (ranked 53rd in the world), this fact is frequently cited as noteworthy, and is ostensibly due to a strong sporting culture. Other observers have suggested this may also be a result of the generous funding the Australian Government has invested into elite sports development with the specific intention of improving performance at the Olympic games. Prior to Montreal, there was no government funding, however. Australia takes international sporting competition, particularly the Olympics, very seriously, and provides much government funding and coaching support to elite athletes, partly through the Australian Institute of Sport. Australia has been more modestly successful in the track events at the games, particularly in modern times. Historically, Betty Cuthbert is Australia's most successful track athlete with four gold medals (three in 1956 and one in 1964). Australia did not win a medal AT the Winter Olympics until 1994, but has moved higher on the medal tallies since then (ranking 13th at Vancouver 2010). This is a reflection on increased funding of Australia's Olympic Winter Games team. These totals do not include 15 medals recognised by the Australian Olympic Committee: 10 medals (3 gold, 4 silver and 3 bronze) won by Australians competing for the combined Australasia team in 1908 and 1912 (8 by individuals, 1 by an exclusively Australian team, and 1 by a combined team); 1 bronze medal won in tennis by Edwin Flack in 1896; and 4 medals (3 silver and 1 bronze) won in swimming by Francis Gailey, an Australian until recently incorrectly classed as American, in 1904. The AOC therefore recognises Australia as having won 512 medals at the Summer Olympics (150 gold, 170 silver and 192 bronze). ^ O, Noel (8 August 2012). "By population, Australia is on top of the medal tally". The Roar. Retrieved 20 April 2014. "Results and Medalists — Australia". Olympic.org. International Olympic Committee.